Renata leading children in Chameleon. The leader never goes in a straight line and varies between walking and running, causing kids to loose grip and go flying with laughter to the ground. 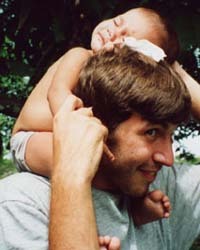 David with sleeping baby on head. I'm 30 years old and was born and raised in São Paulo, Brazil. I have always enjoyed travel, especially since I began to extend my work with popular children's culture in various corners throughout Brazil. Since having this priority, I've already done work in communities in Mato Grosso do Sul, and in Xavante and Guarani indigenous communities in Mato Grosso and Espirito Santo, respectively. For several years, I've also taught a variety of workshops for children and educators in various formal and non-formal institutions in the states of São Paulo, Goiás, Paraná and Minas Gerais. I first visited the Amazon Region in July of 1999 and stayed in two riverside communities in the states of Amapá and Pará. I witnessed children living in a reality little known to the rest of Brazil. Then and there, I resolved to extend my research of popular children's games to this region, and to a certain extent, to try to shorten the physical and social distances so present in this country. I'm 24-years-old and was born and raised in Rockville, MD, USA. I received my Bachelor of the Arts in May of 1999 from State University of New York at Binghamton with a major in literature and rhetoric and a minor in sociology. I began studying the basics of documentary filmmaking to accompany my experience with sound recording, and have just finished shooting 52 hours of raw footage for Project BIRA. Now, having finished this preliminary portion of BIRA, knowing first hand what Renata's passion is all about, and having met so many incredible children, I've also realized something that's been hiding in me since I've been born- in the countless stones I've skipped, kites I've flown, and super-bounce balls I've lost—I love to play and I'll be damned if I ever stop.